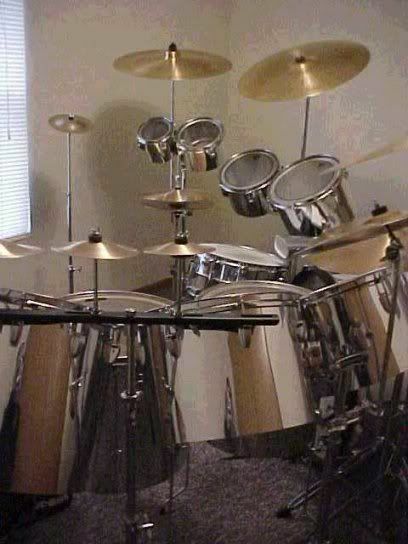 "I am seeking good shots of Carl's stainless steel drum set, as I am replicating it. 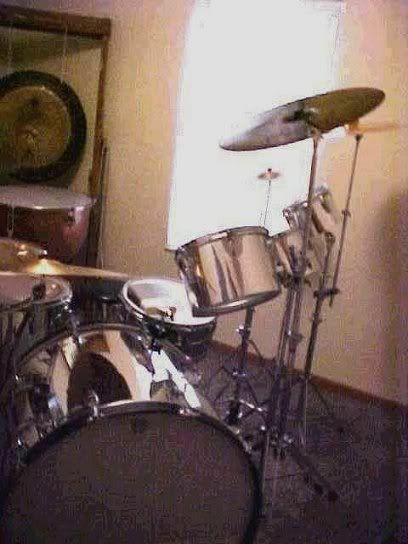 I am a drummer/percussionist as well. I have everything Carl used with ELP except the second gong and the red temple blocks. The rest I have. Everything is set up identically to Carl's, even all drums and Paiste cymbals are the same make and size! "It's been a VERY difficult task because photos at different angles (which I desperately need) are SCARCE. 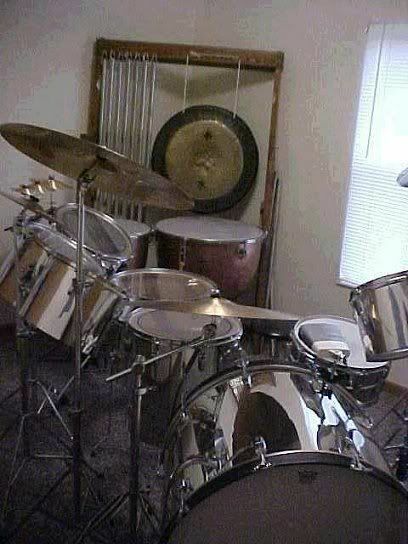 "I'm trying to locate the second, larger gong, and a set of red temple blocks for my set. The temple blocks Carl used were from the 40's and had hand-carved figures on them. They don't make them like they used to! I am keeping my eye opened on eBay. "I made up my mind, that no matter how many years it took, I was going to replicate that drum set - even if I have to make wooden drums have the appearance of stainless steel, and that's JUST what I have done, as you will see. 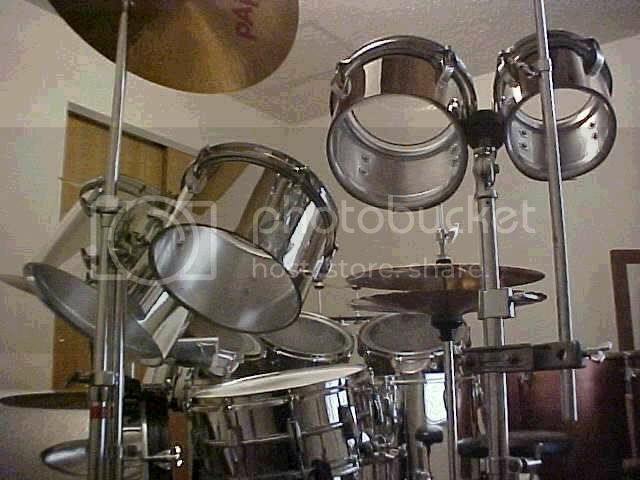 The drums in the pics are chrome lacquered on the inside shells, and chrome drum wrap on the outside. People actually think they are metal. 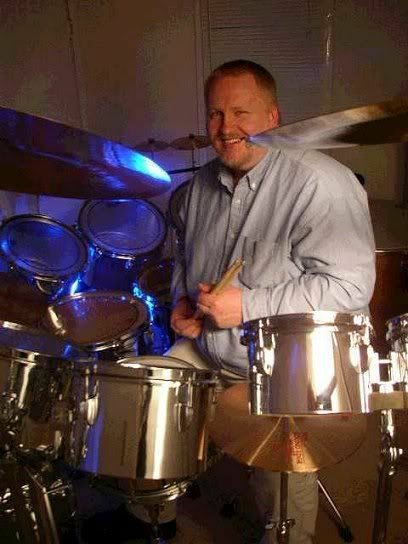 I did all the work myself, except a friend molded the two 28 inch diameter bass drums together to give me the 28 inch diameter x 20 inch deep bass Carl used. **What** a sound!!! The rest, I haven't completed, like the consoles or "black boxes" (as Carl once referred to them) which the drums fit into, and the engravings. It is because of the lack of photos available that I have been unable to build the consoles and have the engravings done." © 2006 Ladies of the Lake.